SURPRISE, ARIZ., April 22, 2012 – A women’s team from Scottsdale, Ariz., representing the USTA Southwest Section, captured the national title at the USTA League 8.0 Super Senior National Championships held at the Surprise Tennis and Racquet Complex in Surprise, Arizona. 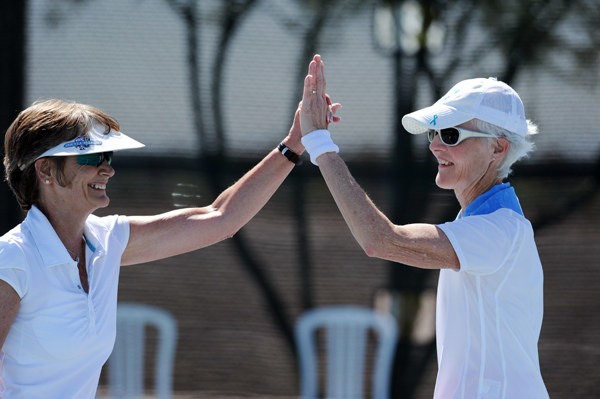 The team was captained by Marsha Speck and features Linda Renner, Susie Murphy, Ann Alpeter, Joyce Sabol, Susan Manolis, Mary Garbaciak, Nancy Theilman and Mary Ann Mitcham and played out of the Indian School Park Tennis Center in Scottsdale. The Phoenix ladies almost didn't make it out of pool play in Surprise, posting a 2-1 record in their three-team pool, and falling to Southern California on the second day by a 2-1 score. But they swept Eastern 3-0 in the last match of pool play to end up with six total match wins. Southern California had lost on the first day, and the Phoenix ladies ended up winning their pool by a single match to advance to the semis. The Scottsdale team defeated a team from Hamilton, N.J., 3-0 in the Championship match. On Saturday night, the Scottsdale team defeated a team from Las Vegas, Nev., 2-1 in the semifinals. They advanced this far by winning their round-robin flight contested Friday and Saturday. The top four teams in order of finish at the Women's 2011 8.0 Super Senior Nationals were: 1) Southwest, 2) Middle States, 3) Florida and 4) Intermountain. This year’s USTA League 8.0 Super Senior National Championship had drawn the top 32 teams (16 men’s and 16 women’s) from throughout the nation. (The tournament is the culmination of the 2011 league season and the only national championship to be held in the year following). 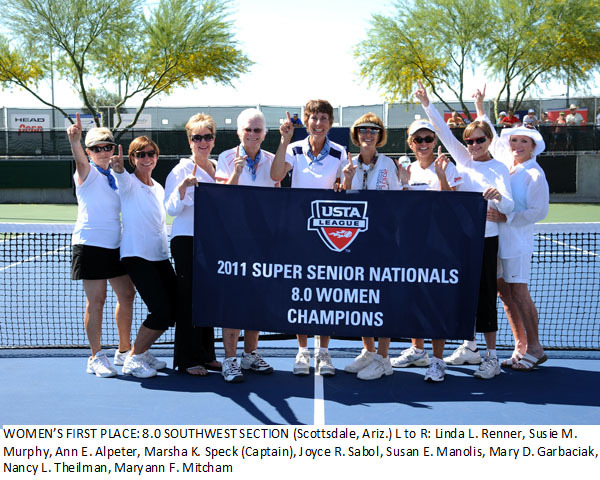 The 2011 national championships win by the Central Arizona ladies marked the third consecutive year in a row that USTA Southwest has won a Super Senior League National. Two years ago the Tucson 6.0 ladies from Saddlebrooke won the nationals, and last year a 9.0 men's team out of Phoenix won the crown. ISP Speck 2, Trilogy Paulson 1; ISP Speck 2, Phoenix Tennis Center Fairburn 1; ISP Speck 3, Trilogy Paulson 0; ISP Speck 3, Phoenix Tennis Center Paulson 0; Trilogy Paulson 2, ISP Speck 1; ISP Speck 2, Phoenix Tennis Center Fairburn 0; ISP Speck 2, Trilogy Paulson 1; ISP Speck 2, Phoenix Tennis Center Fairburn 0. Defeated Northern New Mexico 3-0; Defeated Greater El Paso 3-0; Defeated Southern Arizona 3-0. The USTA is the national governing body for the sport of tennis in the U.S. and the leader in promoting and developing the growth of tennis at every level -- from local communities to the highest level of the professional game. A not-for-profit organization with 750,000 members, it invests 100% of its proceeds in growing the game. It owns and operates the US Open, the highest attended annual sporting event in the world, and launched the Olympus US Open Series linking 10 summer tournaments to the US Open. In addition, it owns the 90 Pro Circuit events throughout the U.S., is a minority owner and promotional partner of World TeamTennis, and selects the teams for the Davis Cup, Fed Cup, Olympic and Paralympic Games. The USTA philanthropic entity, USTA Serves, provides grants and scholarships and through tennis, helps underserved youth and people with disabilities to improve academics and strive for excellence. For more information on the USTA, log on to usta.com.The USTA League program celebrated its 25th Anniversary in 2005. Established in 1980, it has grown from 13,000 participants in a few parts of the country in its first year, to over 665,000 players across the nation today, making it the world’s largest recreational tennis league.